The rumors were true — Samsung actually made a 18.4-inch tablet, and it’s called the Galaxy View. 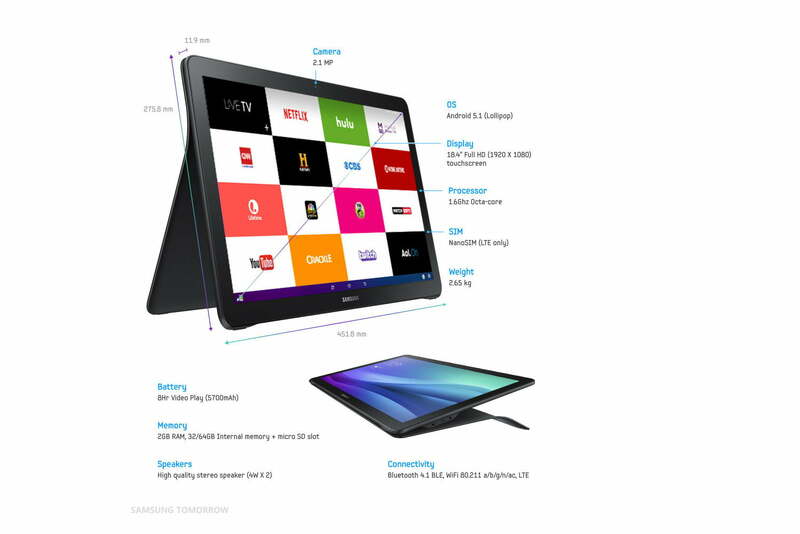 The massive tablet could be considered more of a portable TV than an actual tablet, given its size and dimensions. Samsung revealed initial details in a press release on its blog, and shortly followed up with availability and pricing. Updated on 11-16-2015 by Malarie Gokey: Added pricing and release date info from AT&T. Samsung started selling its mammoth tablet on November 6 in the U.S. for $600. Best Buy, Amazon, and other major retailers also offer the Galaxy View, and now AT&T has joined the group. On November 20, AT&T will sell the Galaxy View in stores and online. You can get the LTE version of the View with a two-year data contract for just $100 if you sign up for 24 months of DirecTV. Current DirecTV customers who activate a new line with a phone on AT&T Next can also get the Galaxy View for $100, with a two-year contract. The DirecTV deals are limited-time offers with no clear expiration date. Alternatively, you can get the tablet on an installment plan for $0 down and $30 per month for 20 months or $500 with a two-year contract, if you’re not with DirecTV and have no desire to switch. You can read all the details here. The Galaxy View sports a huge 18.4-inch screen with a Full HD resolution of 1,920 x 1,080 pixels. Since it’s meant to function like a TV that you bring from room to room in your home, it has a handle on the back and a built-in stand. The stand moves into two positions, one presumably for viewing on a table top and another for watching shows with the device on your lap or while in bed. Samsung popped in two 4-watt speakers to make the audio experience better than that of your average tablet. It’s powered by an unspecified 1.6GHz octa-core processor and 2GB of RAM, which should be enough to power all your favorite video streaming apps. Samsung’s offering the View with either 32 or 64GB of storage, though a MicroSD card slot should open up more space for video, if you’re the kind of person who downloads instead of streaming. The 2.1-megapixel front-facing camera is presumably for video calls. Samsung claims that its 5,700mAh battery should keep the View running for 8 hours of continuous video streaming, which is great news for binge watchers. The whole tablet weighs 2.65 kg, which is lighter than you would expect for a tablet of such great proportions. In the press release, Samsung vaguely mentions that the Galaxy View has a special interface and home screen where all your favorite video streaming apps live. One picture from the company shows a grid format with popular apps like Hulu, Netflix, History, YouTube, Crackle, and more. However, the device is actually running Android 5.1 Lollipop. Samsung further says that the Galaxy View is purely an entertainment device that’s geared toward gameplay, video streaming, and other visual experiences.